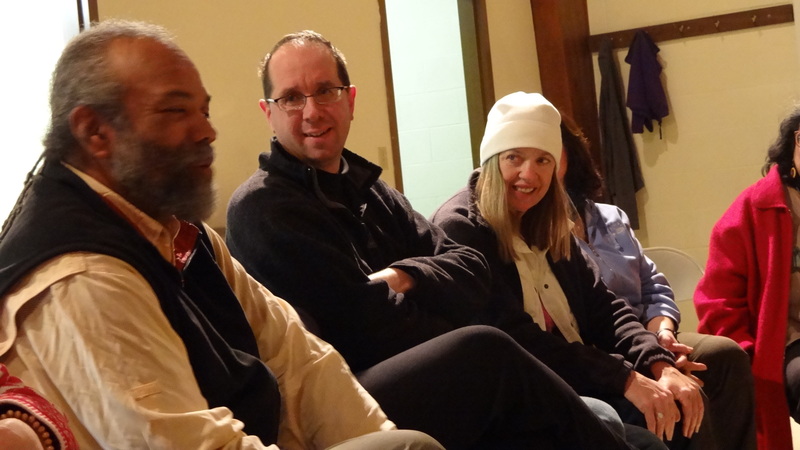 Wednesday the group was joined by Mark Johnson of the Fellowship of Reconciliation for the first leg of the walk. 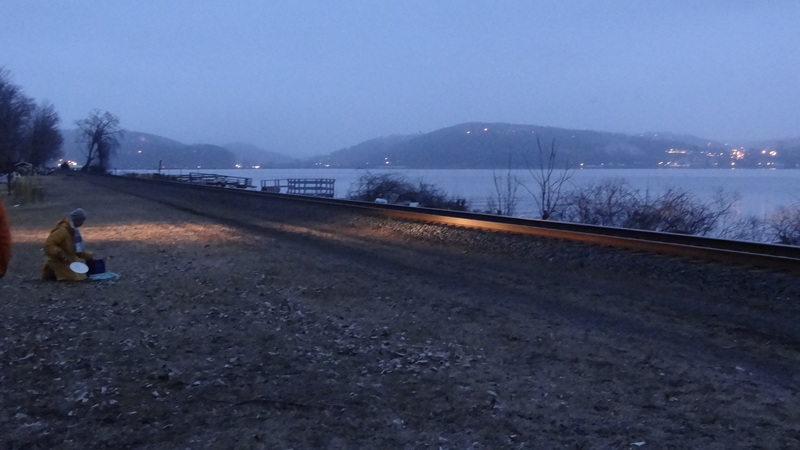 It was a beautiful day walking along the Hudson and through the Palisades. At the 6 mile mark the walkers stopped for lunch outside a small cafe where Mark Johnson left to return to FOR. The community was very welcoming, and people continually came up through lunch to offer their thanks, take photos of the banner, take flyers back home. John rode his bike down to meet the group, and invited us back to the university to visit the earthquake museum on our way out of town. 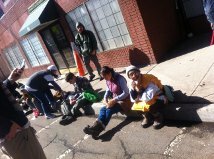 About 3 miles out from the lunch spot we came to Columbia University, where John showed us seismographs and explained in greater detail the process of documenting earthquakes. The walk continued on towards the city. 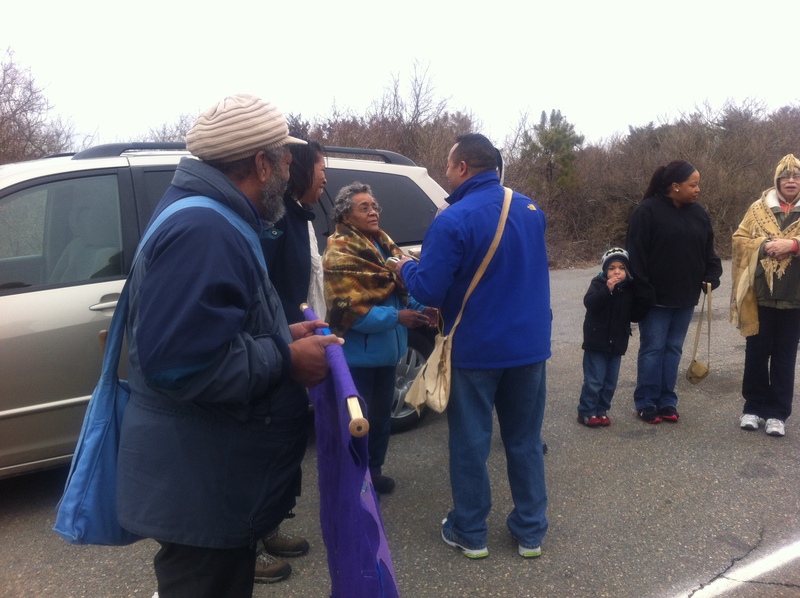 At the 15 mile point the walkers hopped into vans and shuttled forward to the Highbridge community in the Bronx. Tuesday the walk had a rest day in Nyack at the Fellowship of Reconciliation. FOR is stationed in a building named Shadowcliff, a massive estate overlooking the Hudson River. It was a beautiful rest day. It was one of the only days on the walk so far that it’s rained all day, we were lucky to be indoors. The staff of FOR were incredibly helpful and welcoming! 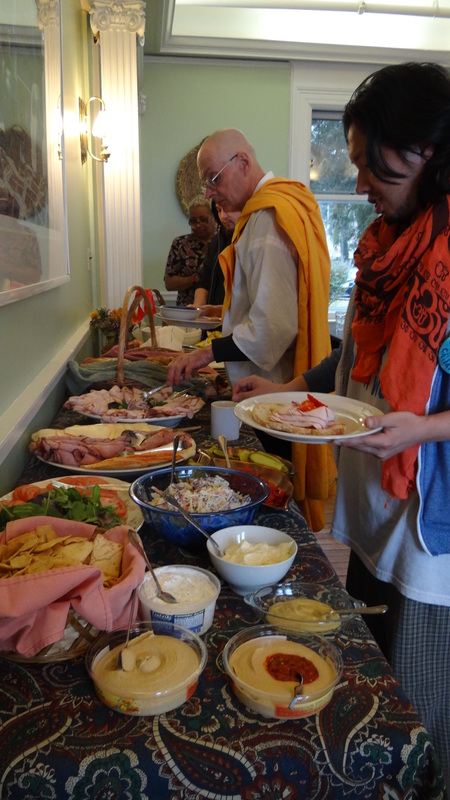 Mary cooked up an incredible gourmet spread for each meal (including desert), Heshi, Jonette, and Linda spent time getting to know the walkers and sharing information with us about their programs like the “Young, Pacifist and Proud” initiative, and a recent newsletter which featured information on Leverett Peace Pagoda’s inauguration. 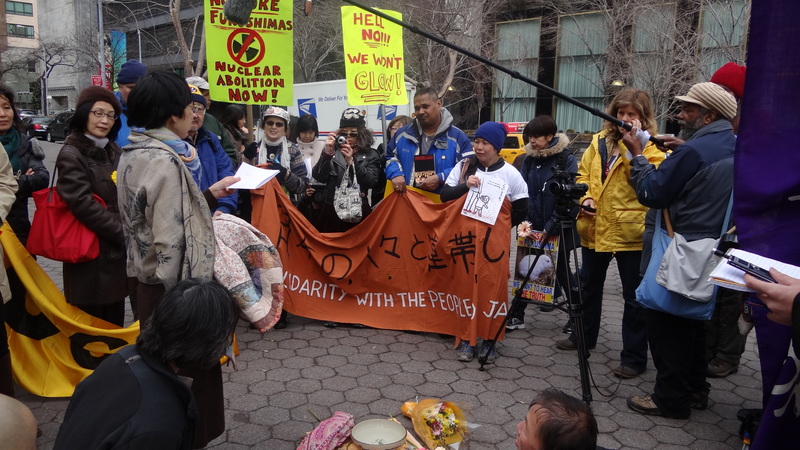 Linda sat down for a 40 minute interview with some of the walkers for to learn more about the walk, nuclear disarmament, and Na Mu Myo Ho Ren Ge Kyo. 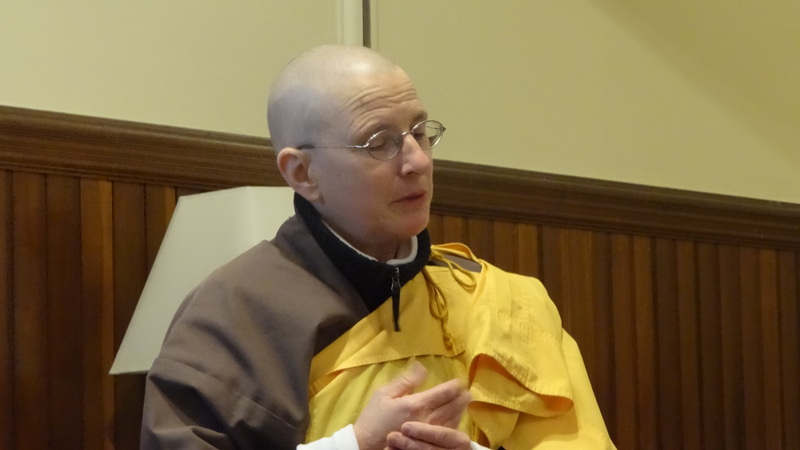 At FOR we got a chance to watch two films, Samsara and America’s Chernobyl. It was a good chance to reevaluate why each of us were walking and envision what a nuclear free future actually looks like. 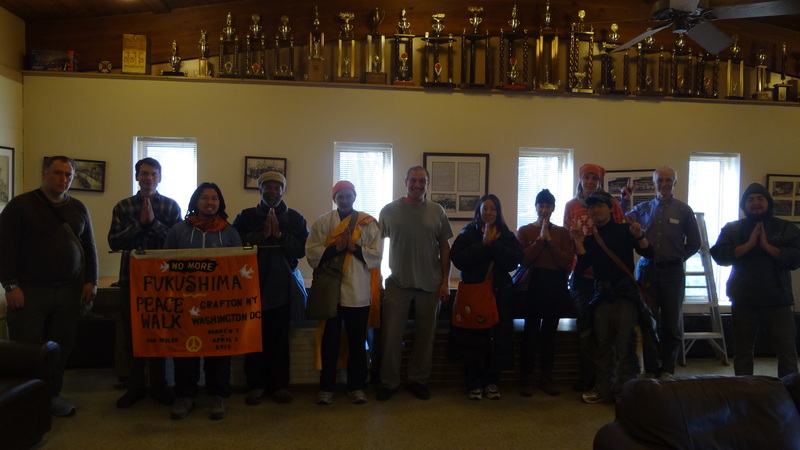 We said goodbye to two of our walkers, Larry & Nurya who had to return home to other responsibilities. Hopefully they will be back. 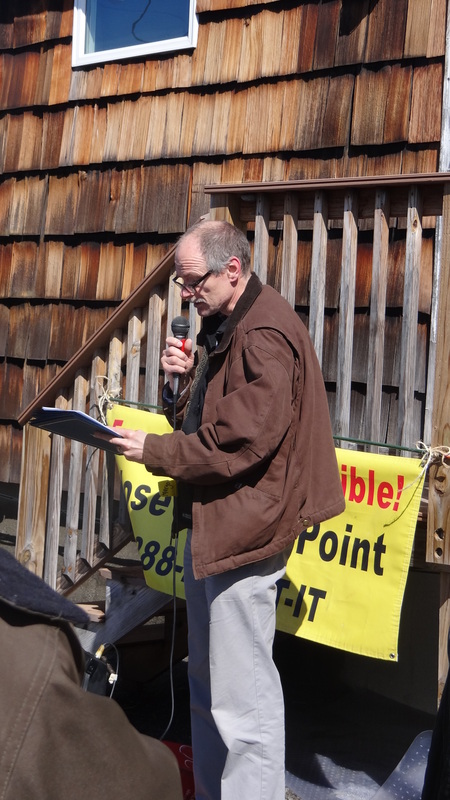 In the evening a professor from the Lamont-Doherty Observatory at Columbia University came to speak to the walk about the dangers of nuclear power from a seismological perspective. 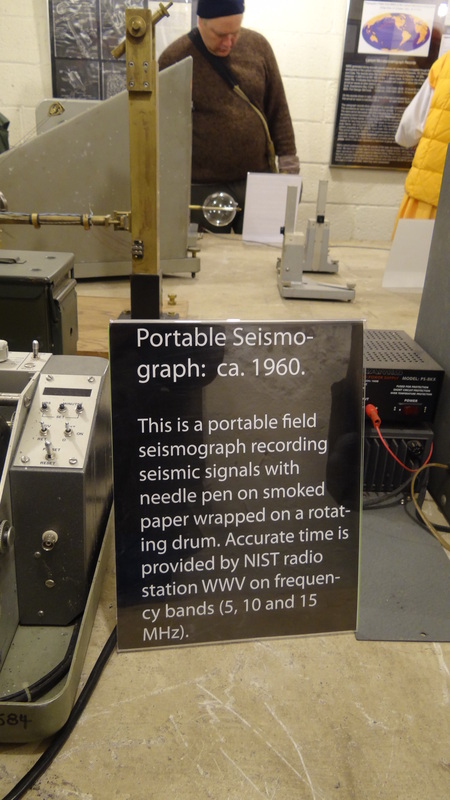 John explained that earthquakes on the east coast are much smaller than earthquakes on the west coast, so small that many times they are not even felt by the average person. 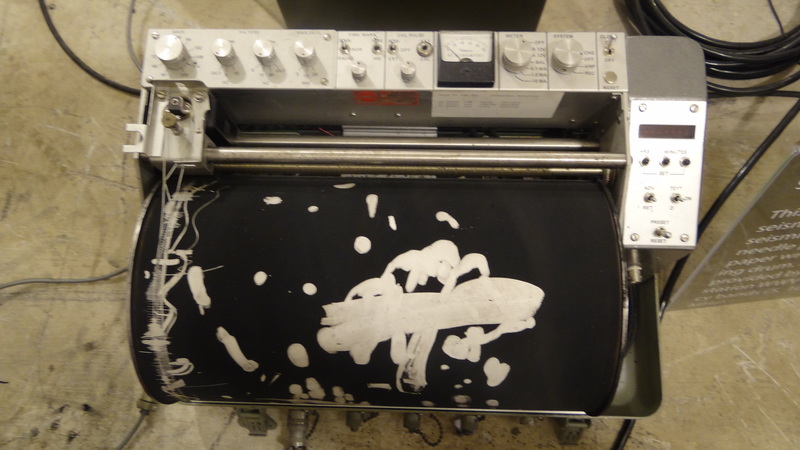 Smaller earthquakes can cause problems to the reactor in a much less obvious way than a direct meltdown. For instance, if an earthquake occurs in upstate New York near Indian Point (which is on two fault lines) the community may not notice. But the control panel which enables the operators at the plant to control heating or power may be affected. There is no way to be sure that smaller earthquakes have not already caused damage to this reactor in a way that the community does not yet know about. 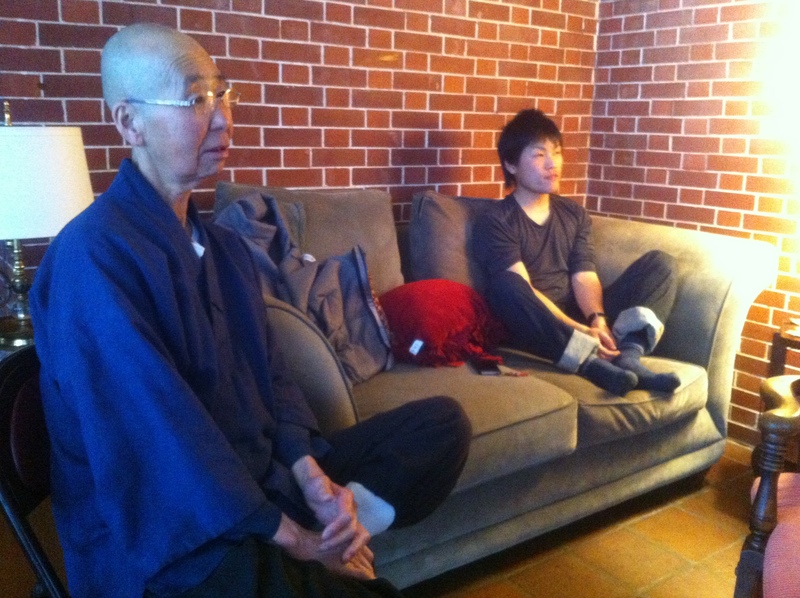 We also watched a great video that was on CBS of Maurice Enis and Jamie Lee Plym, the two Navy vets who became very sick after their work near Fukushima. 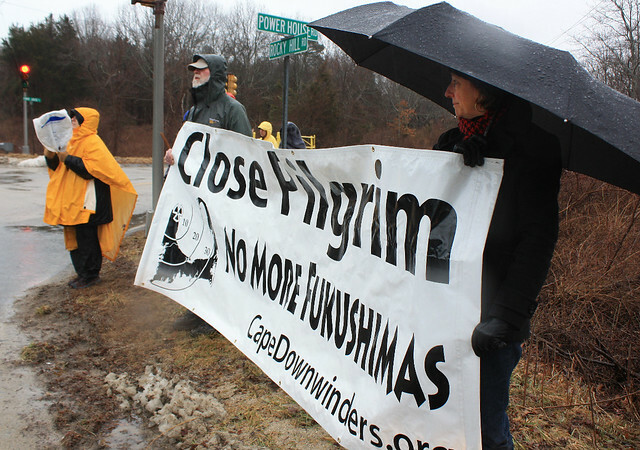 For the two year anniversary of the meltdown at Fukushima Daiichi Prefecture the Walk for a New Spring & the No More Fukushimas walk gathered at Indian Point reactor for a vigil and ceremony praying for safety, sustainability, peace, and a nuclear free future. 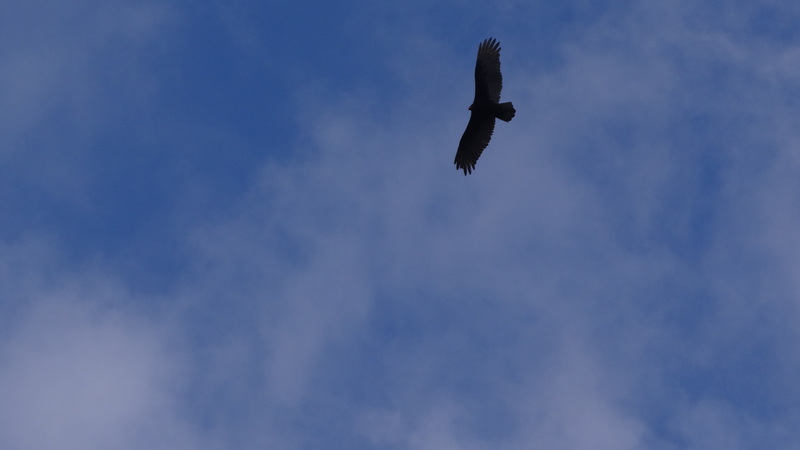 A local man came out screaming that it was too early for this kind of activity, and threatened to call the police. 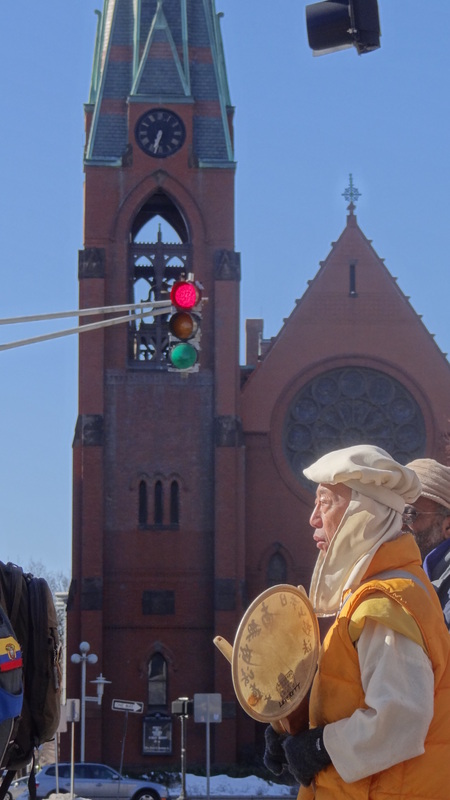 The group continued to drum and chant the prayer softly for about a half hour and each person came up to offer peace cranes. After the ceremony the landlord of the house came out, an older Irish man who was incredibly friendly and understanding and apologized for his tenant. 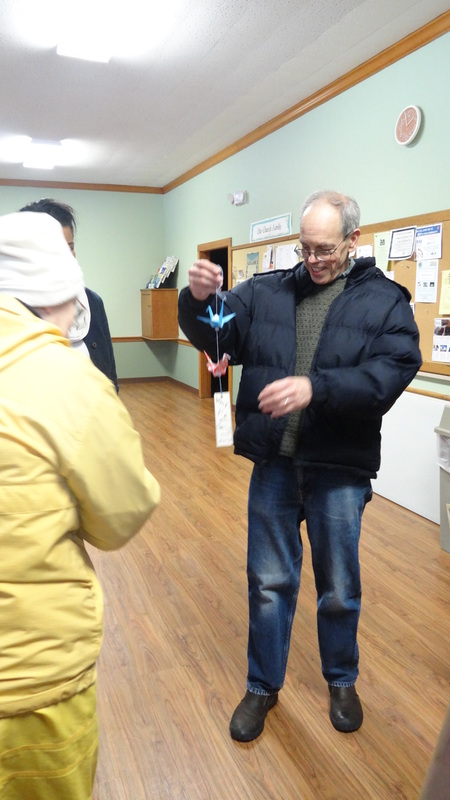 Miki, a walker, offered peace cranes and he accepted graciously. 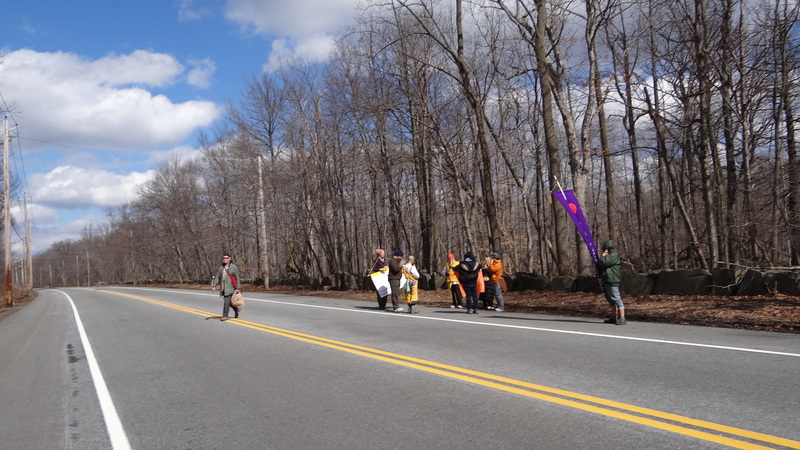 The walkers headed back to Stony Point Center where they had a beautiful breakfast before driving forward to Manhattan to participate in another ceremony to remember Fukushima. 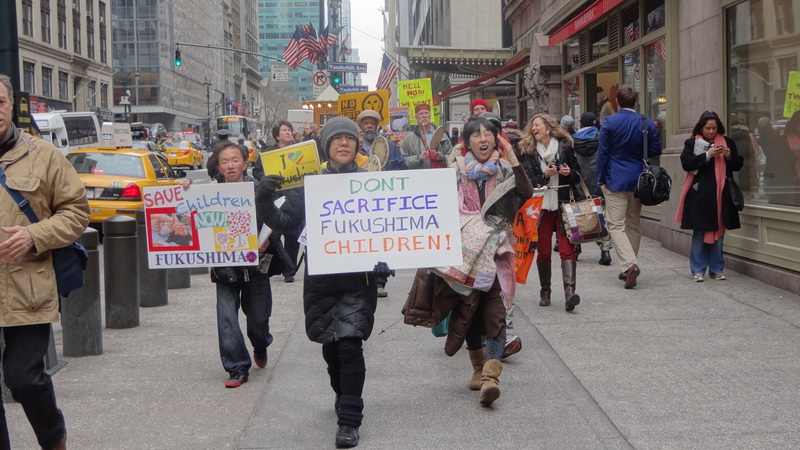 In the city the peace walk met up with the World Network For Saving Children From Radiation, a network dedicated to making sure no more children grow up with the threat of deformities, cancer, and death from radiation. 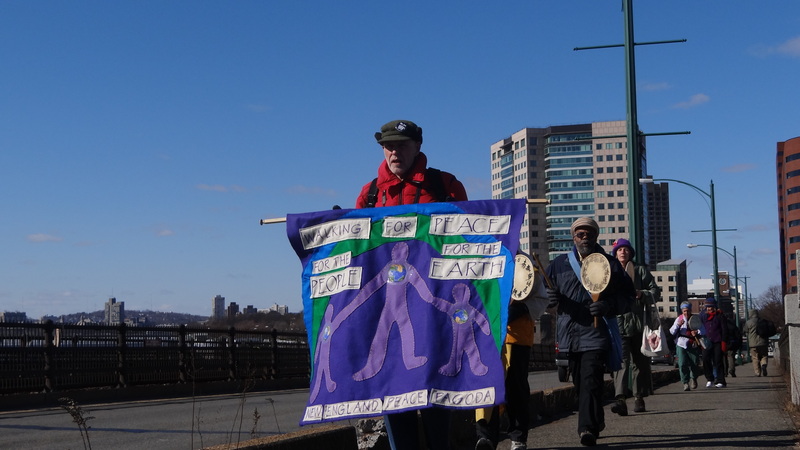 There was a walk from Times Square to Dag Hammarskjold Plaza and a ceremony and vigil in front of the United Nations. 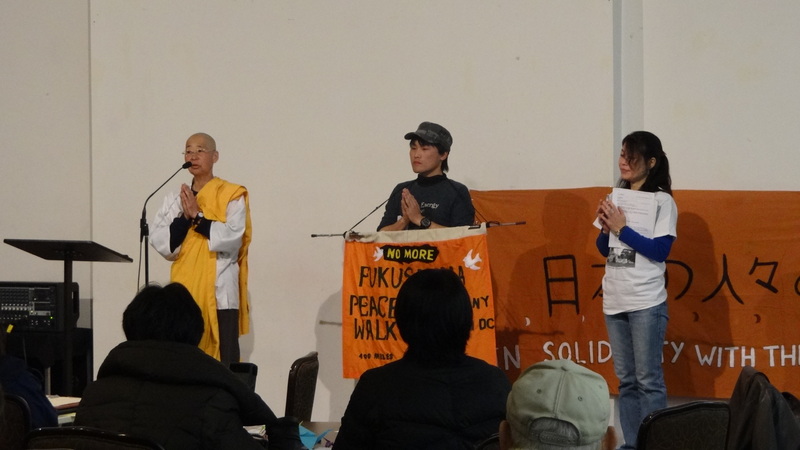 Three women from Fukushima shared their stories of displacement and illness following the meltdown. They currently live in New England. 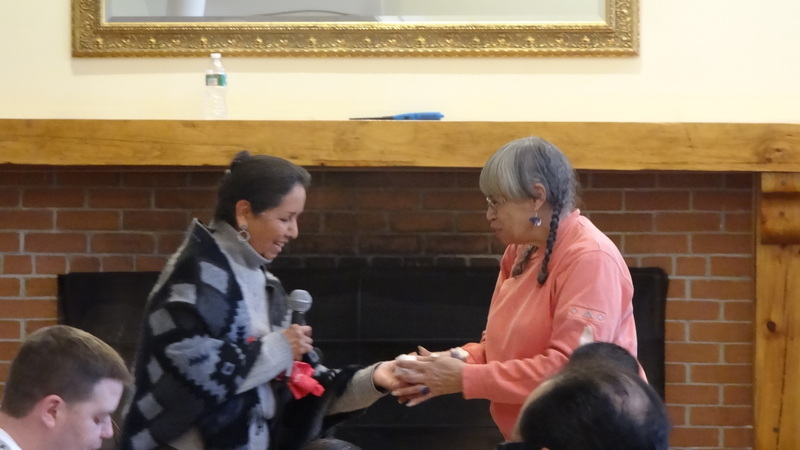 Charmaine White Face a representative from the Great Sioux Territory and coordinator of Defenders of the Black Hills sent a solidarity message which was read aloud in English and Japanese. 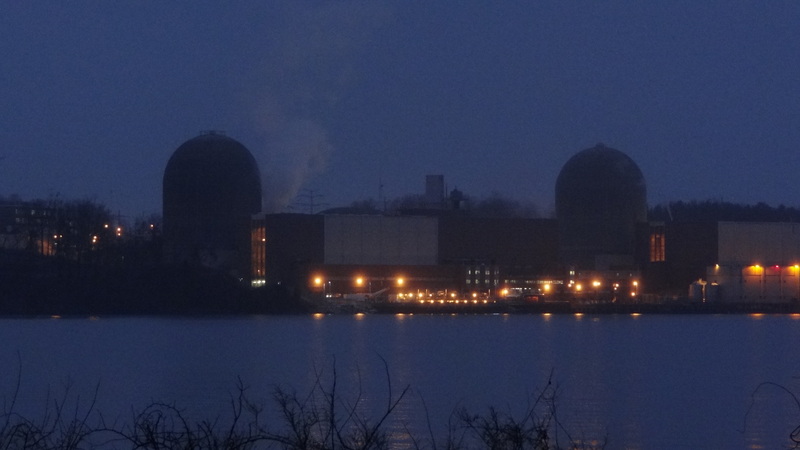 Activists came out from all around New York and New Jersey including activists working to shut down Oyster Creek reactor in NJ, and Indian Point in NY. 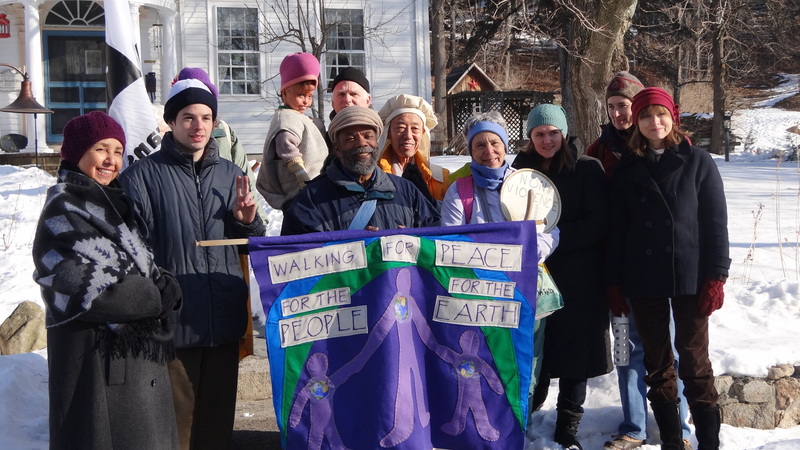 This morning the walk set off from 1st Presbytarian Church in Ossning, NY. 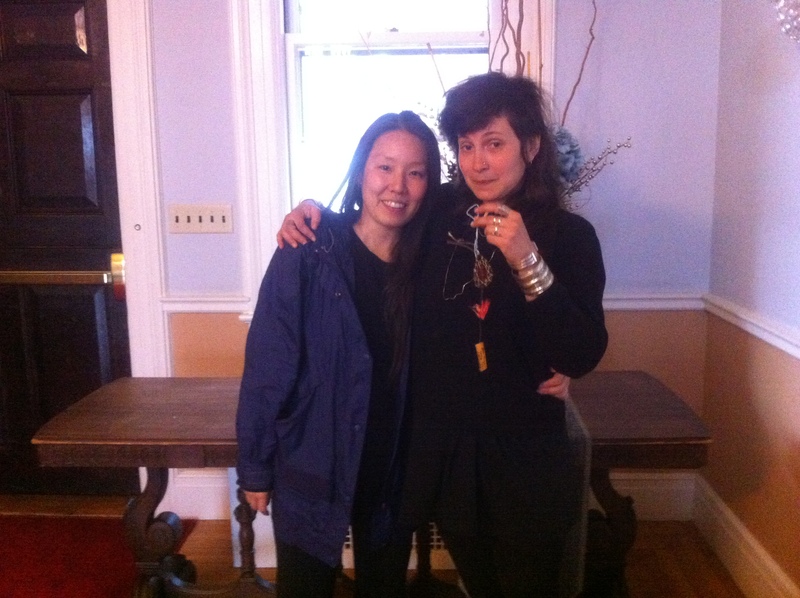 Thanks to Dan Fullerton and his partner Duna for welcoming us so warmly at the last minute. We set off for Stony Point, stopping for a bathroom break at the local Fire Station. Thanks so much to Mike the volunteer firefighter who let us in! We stopped for lunch outside of the The Runcible, the first day this walk could break in the sunshine. 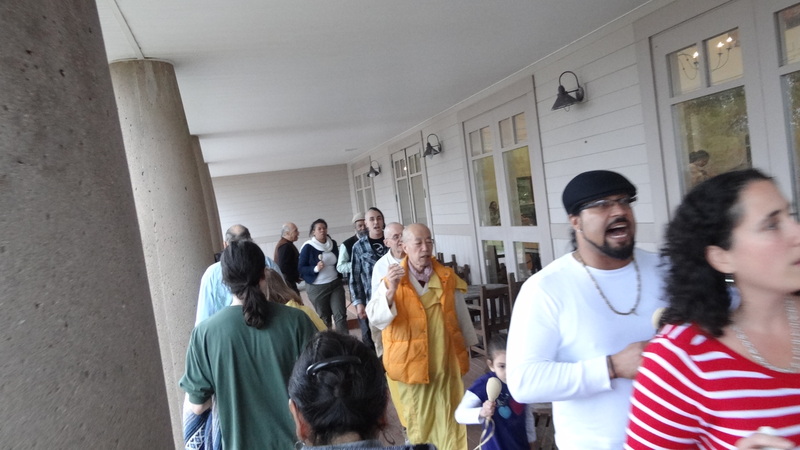 After lunch the walk continued on to Stony Point Center where the group took part in the Fukushima Fallout conference. 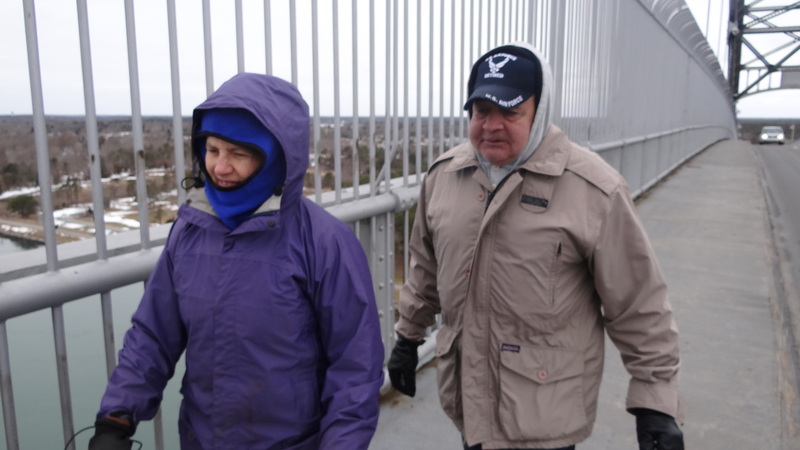 Former Navy Sailors Maurice Enis and Jamie Lee Plym shared again their experiences with the navy, and their health ailments following their irradiation. 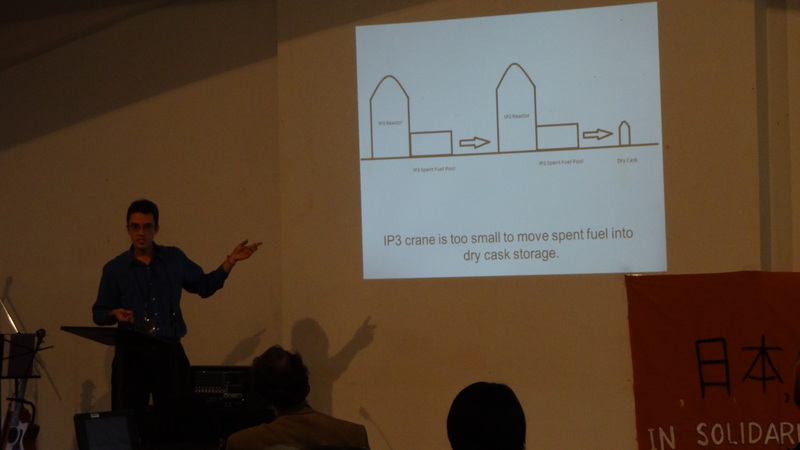 Roberto Muller of the Stony Point Convergence shared a presentation about Indian Point, and Martin Lucas premiered his film, Cold Shutdown, the story of Fukushima in the aftermath of the nuclear meltdown. 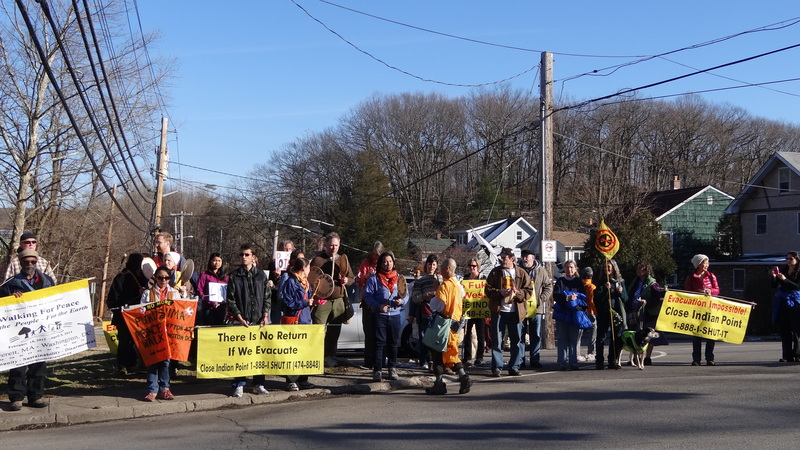 This morning the two walks converged at Croton on Hudson for a press conference and short gathering before marching on to Indian Point Nuclear Facility. 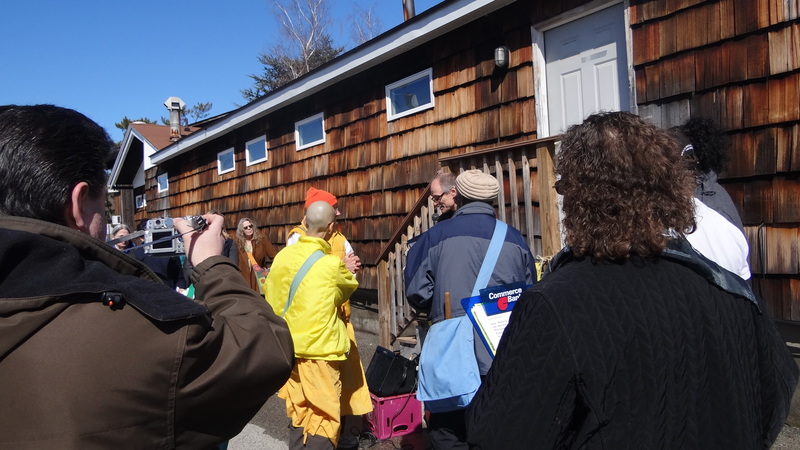 About 50 people turned up for the event which was organized by the Indian Point Safe Energy Coalition in conjunction with Grafton Peace Pagoda and the New England Peace Pagoda. 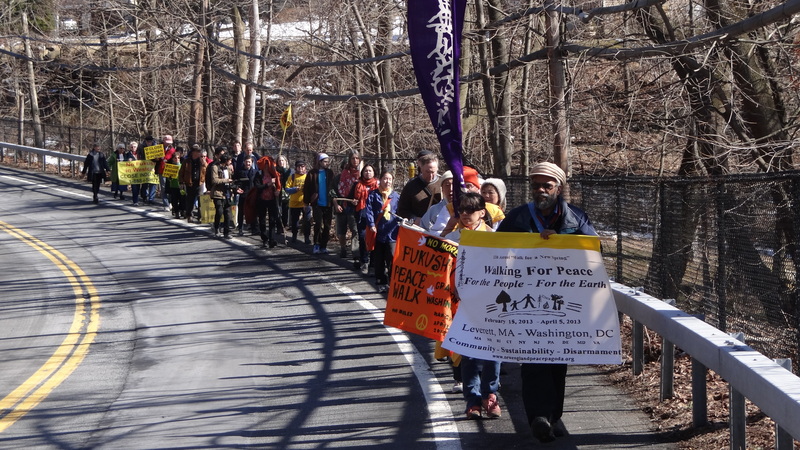 The mayor offered his support and made all participants honorary peace walkers and honorary citizens of Croton on Hudson. 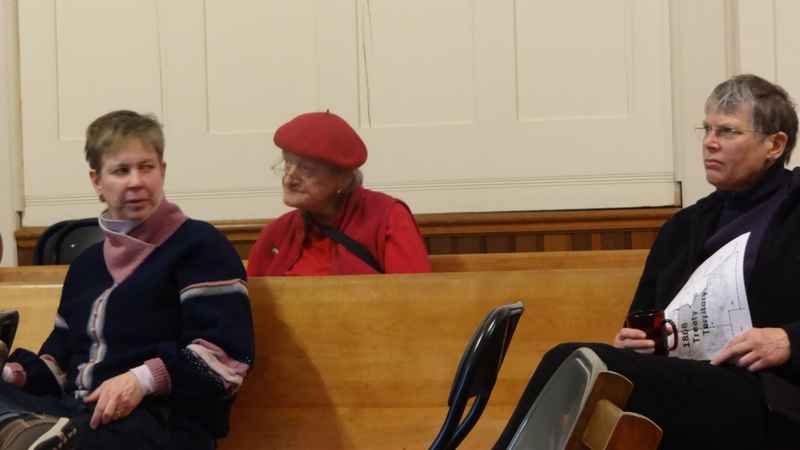 Next up was a presentation by Maurice Enis and his fiance Jamie Plym, two former Navy sailors who were irradiated in their time serving off the coast of Japan. 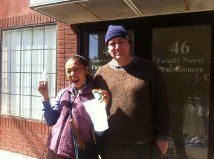 The two of them explained what it’s like now without any insurance since they honorably separated from the Navy, and their serious health ailments. 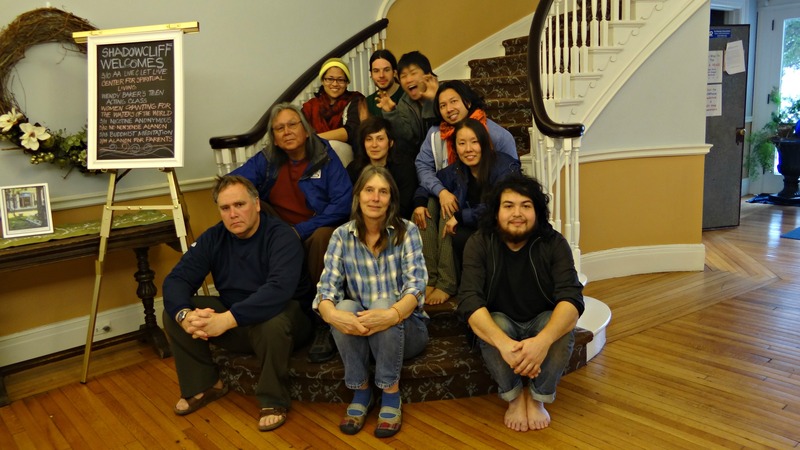 They will be coming to Stony Point Center tomorrow afternoon after the walk to share their story during the “Fukushima Fallout” conference [http://www.ipsecinfo.org/]. 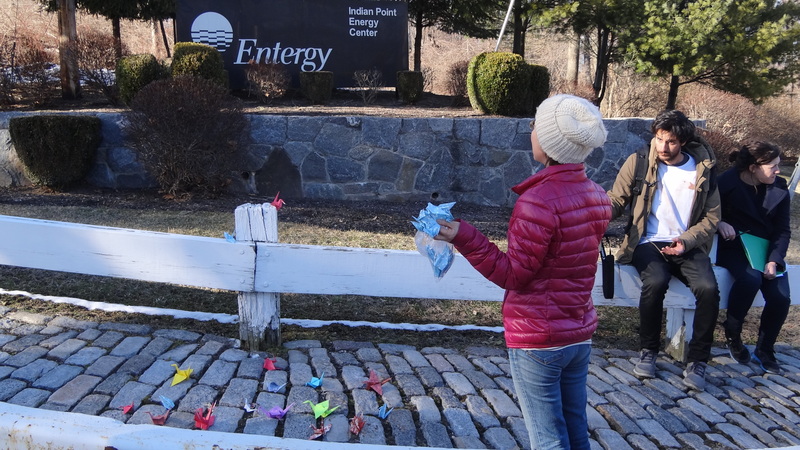 After the gathering at Croton on Hudston train station the group walked down about 6 miles to the Indian Point Nuclear Reactor where they had a vigil and offered peace cranes before gathering in a circle for a short ceremony. The walk route has been changed tomorrow. 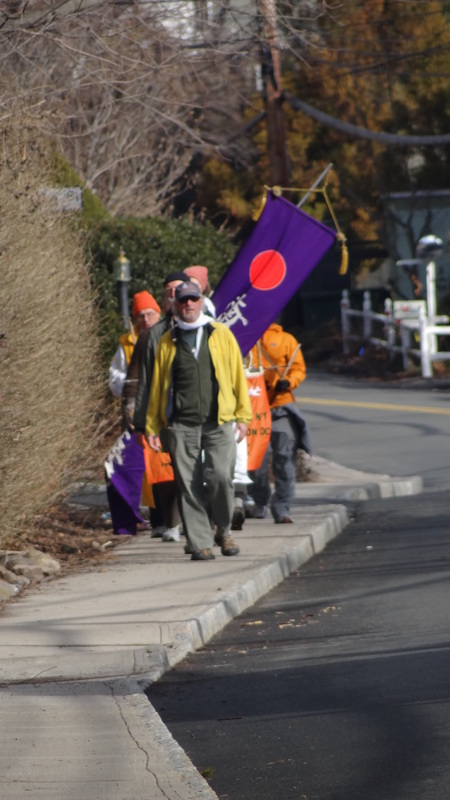 Rather than beginning at Indian Point Nuclear Reactor, the walk will begin at First Presbyterian Church on 34 S. Highland Ave in Ossning, NY. Sorry for any inconvenience, this route is much safer. 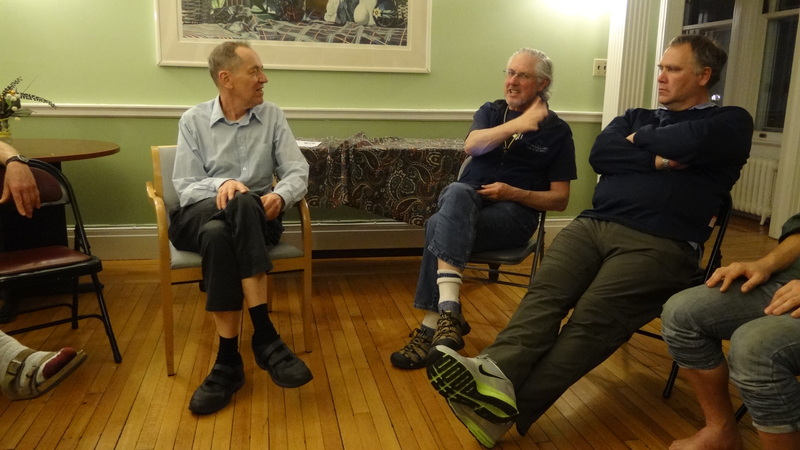 Friday the walk had its rest day at the Louis D. Brown Peace Institute in Dorchester. The Louis D. Brown Institute was founded after Tina Cherry lost her son to violence. 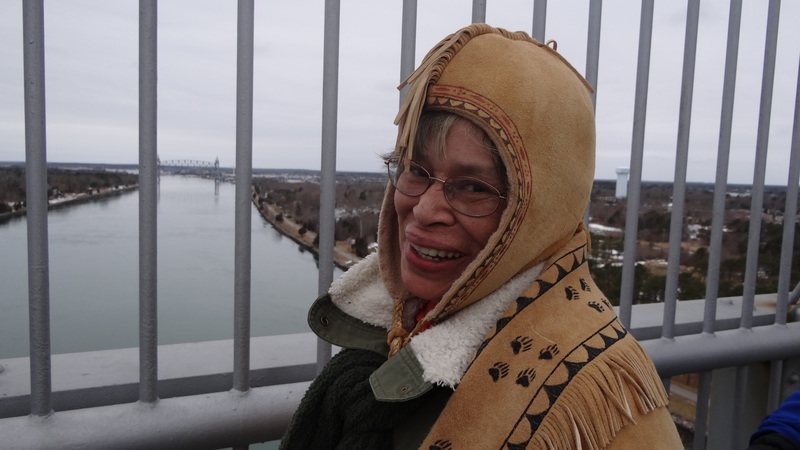 She wanted to create a place of peace and healing so that families dealing with homicide – victims and perpetrators, could come together. It was a beautiful rest day and the group was joined by long time walker Neelia Sargent, and Western activist George Esworthy. A big thank you also to Jane, Phoebe and Sam who hosted some of the walkers! 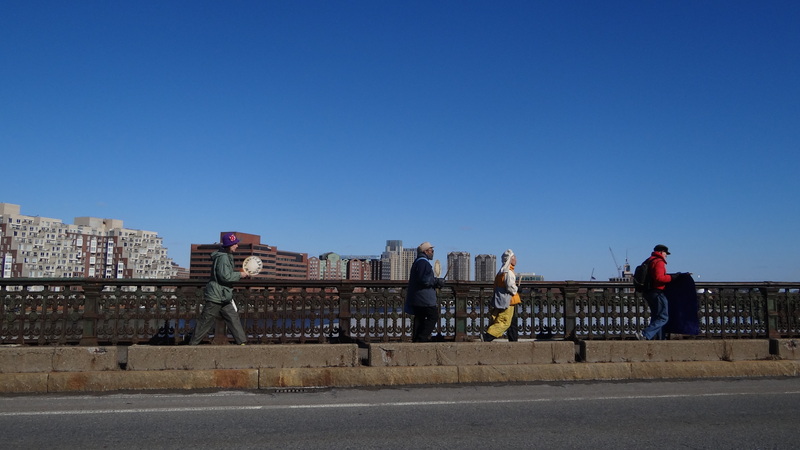 T he walk left the Louis D. Brown Institute for the Bourne Bridge where they met up with some Wampanoag friends in the area. 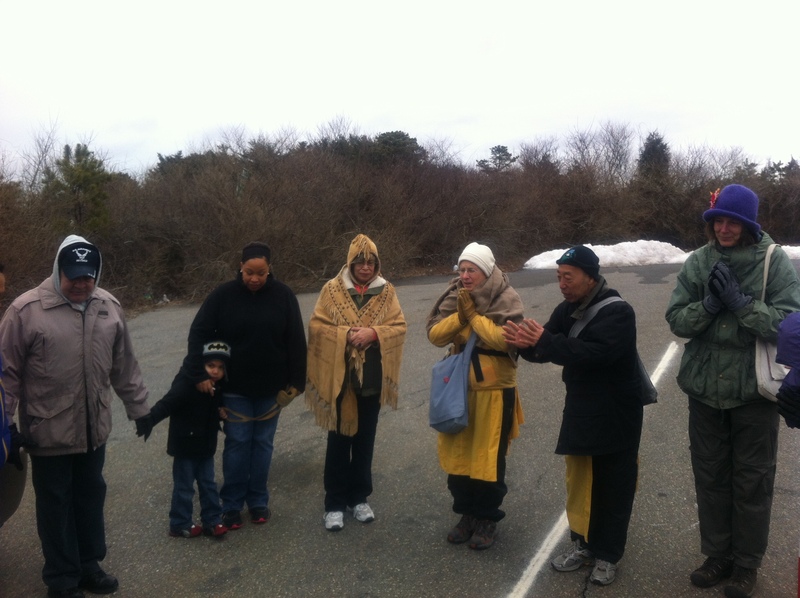 Troy, Sonia, Mother Bear, Hazel, & Kim were among the group who came out to walk for the morning onto the Cape. 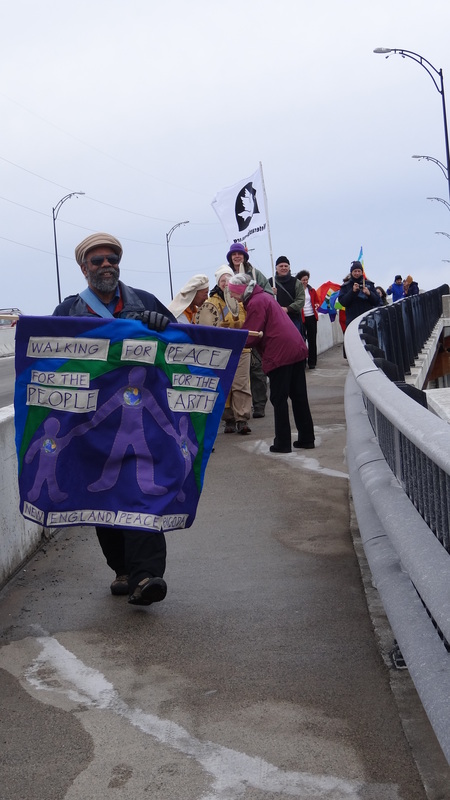 Troy led the group in a prayer, and the walk set off across the Bourne Bridge. 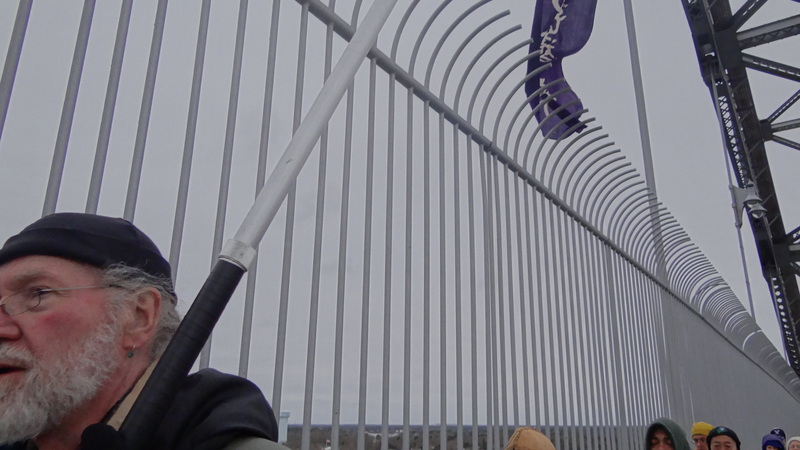 Reception was generally supportive – one man even stopped his truck on the bridge to ask for a brochure. After the Bridge the walk continued on for another 6 miles where they stopped for lunch at the Cataumet United Methodist Church. While the walk was coming over the bridge some walkers drove ahead the support vehicle and the cars to drop them at the 6 mile mark where the group was to stop for lunch. Exactly 6 miles ahead was the Cataumet United Methodist Church. 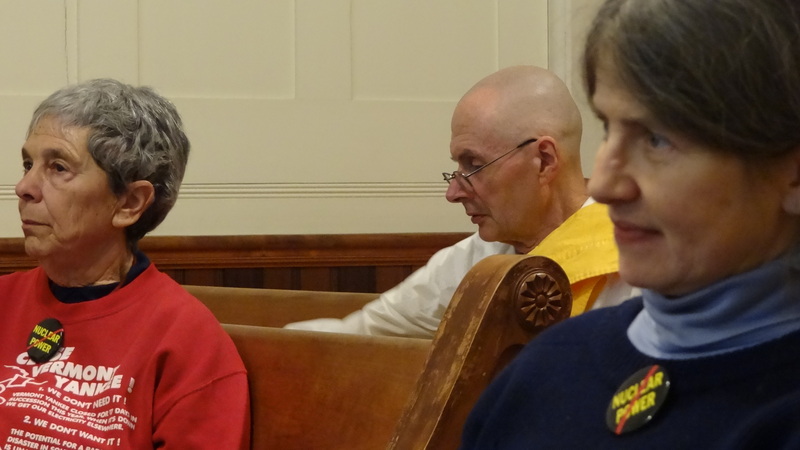 The drivers knocked on the door of the home next to the church, hoping for a bathroom stop. The home belonged to Pastor Tim Atwater and his family, who welcomed us in immediately, offering hot water, coffee and food to the group. Special thanks to Pastor Tim and the generosity of his family who gave the walk a beautiful space to rest and have lunch. 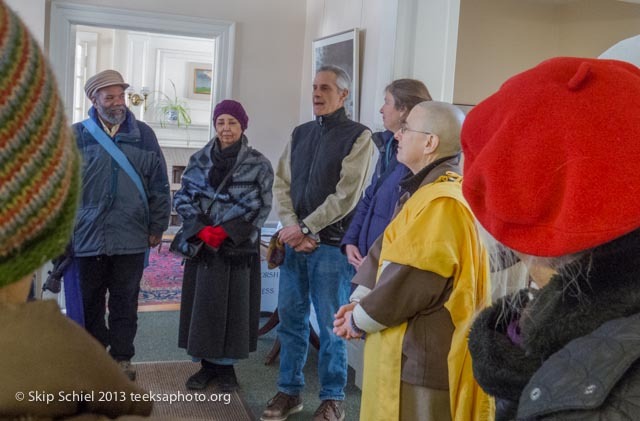 After lunch the group drove to Plimoth Plantation for the Wampanoag Winter Social. 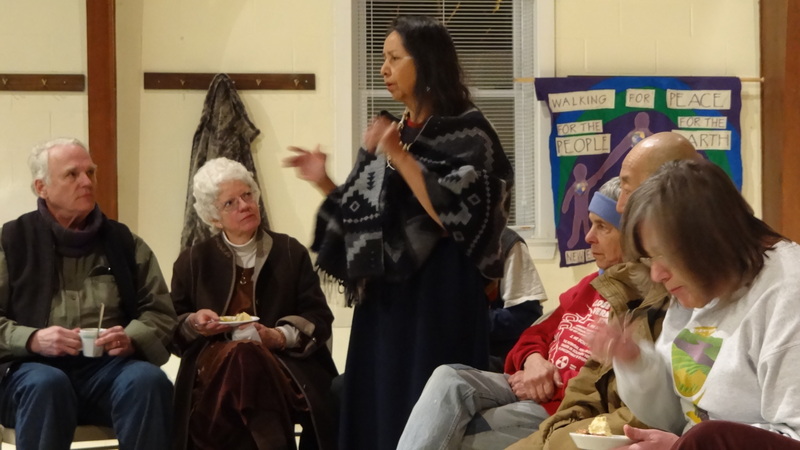 This year the group was celebrating the 40th Anniversary of the Wampanoag program at Plymouth Plantation. 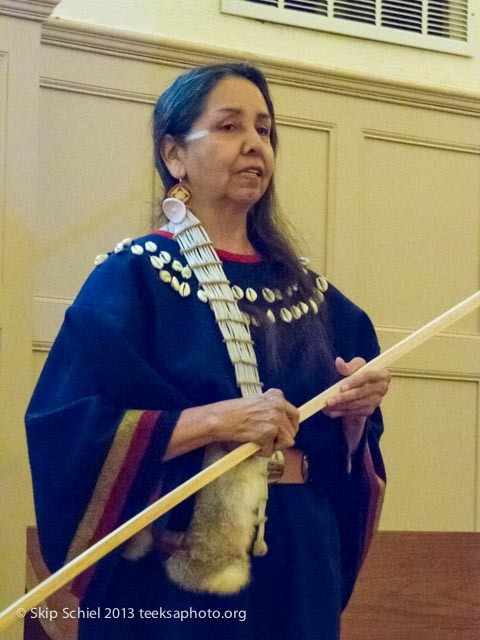 After music and food Charmaine spoke about the work of Defenders and her speaking tour with the Peace Walk, and offered gifts of tobacco, buffalo & traditional Sioux earrings to Mother Bear. 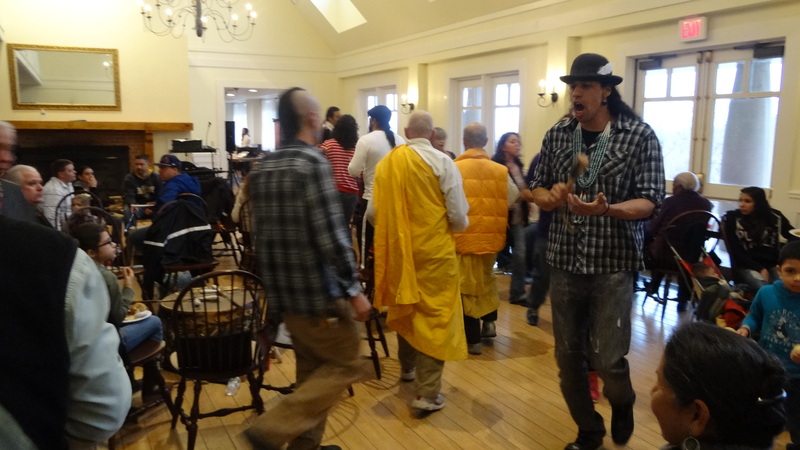 Wampanoag dancer, drummer, and member of the group Eastern Suns, Annawon Weeden led a snake dance in honor of Charmaine’s visit. 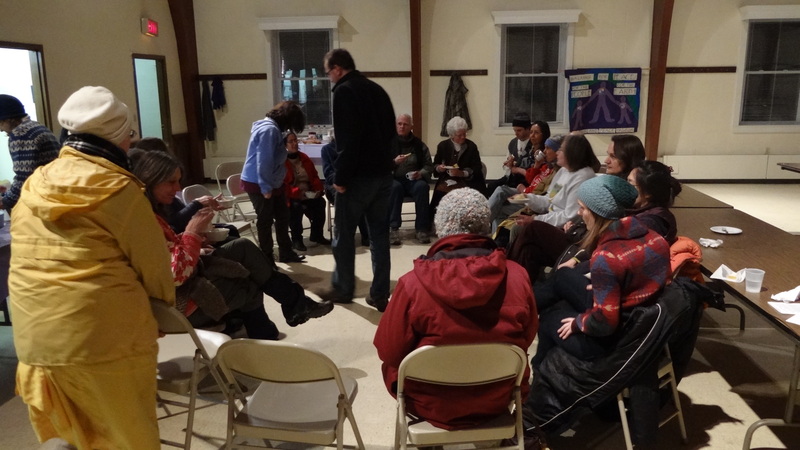 From the social the walk continued on to the West Falmouth Friends Meeting. 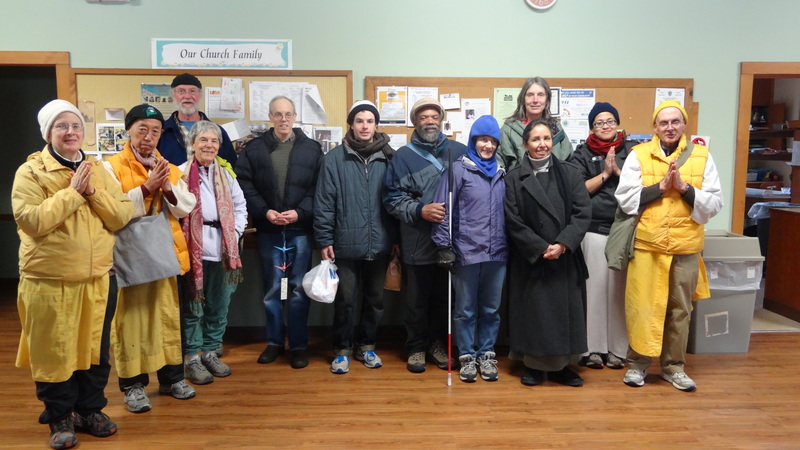 After a beautiful night in Salem walkers left Wednesday morning for Cambridge, Mass. 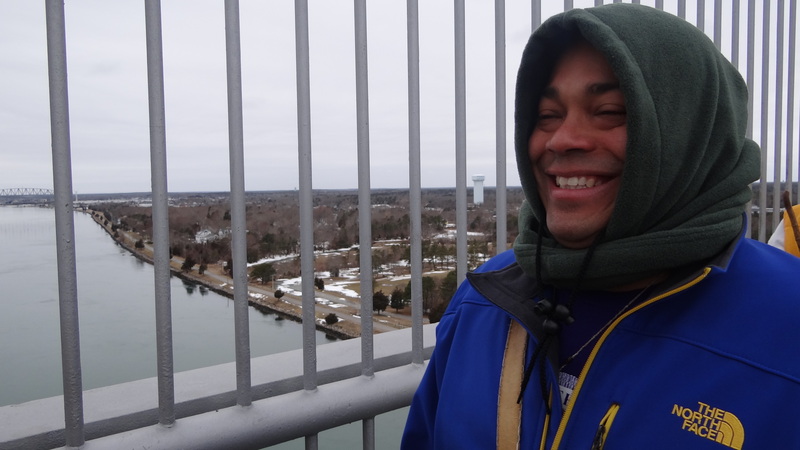 It was about a 10 mile walk through the wind along the shore. 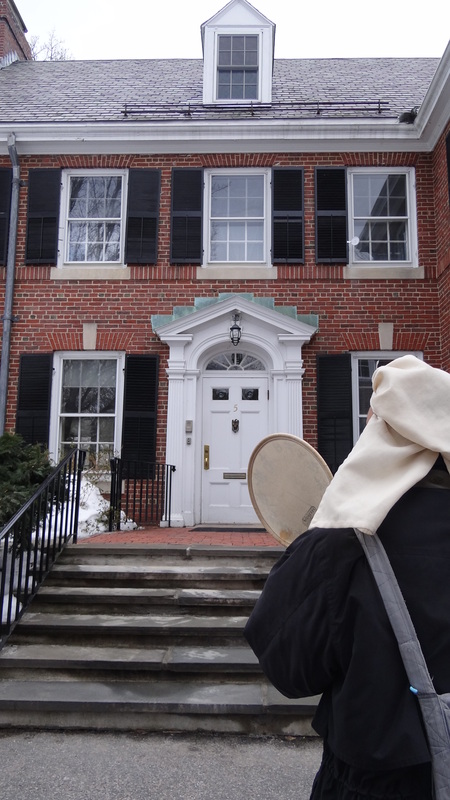 The walk arrived Wednesday afternoon to the Cambridge Friends Meeting House where the group was met by their host for the evening John, a member of the meeting. 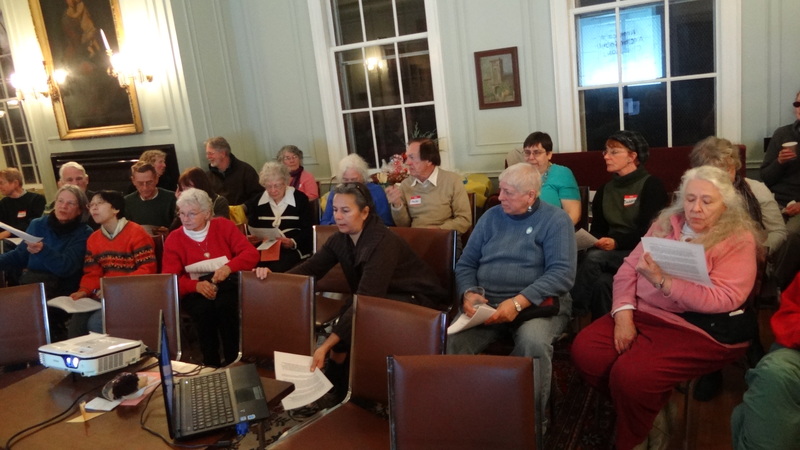 After a potluck dinner provided by the community Charmaine gave her presentation, “America’s Chernobyl”, about 30 people were in attendance. 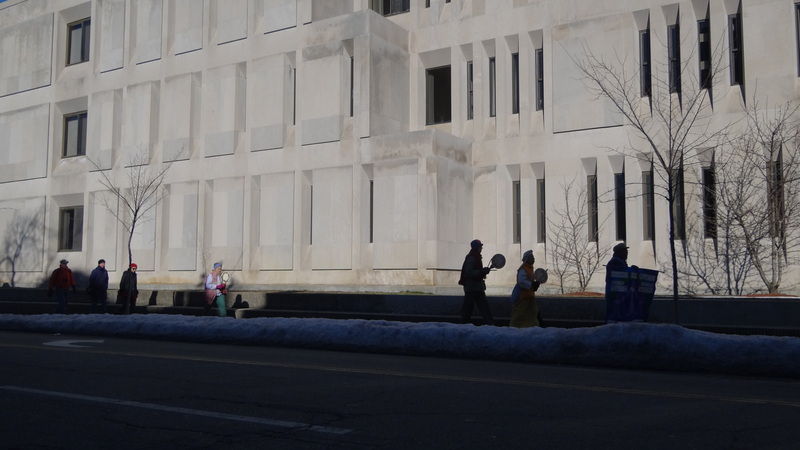 Thursday morning the walk left the Friends Meeting for the State House. 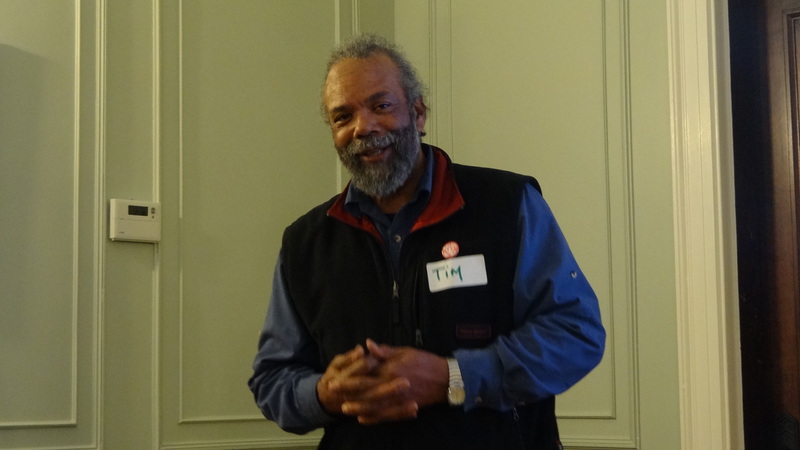 A few locals joined for the meeting with Representative Byron Rushing (9th Suffolk District of Mass), 2 Representative Aids from the Department of Energy, 2 Aids from the office of Governor Patrick, and 1 Representative Aid from Northampton. 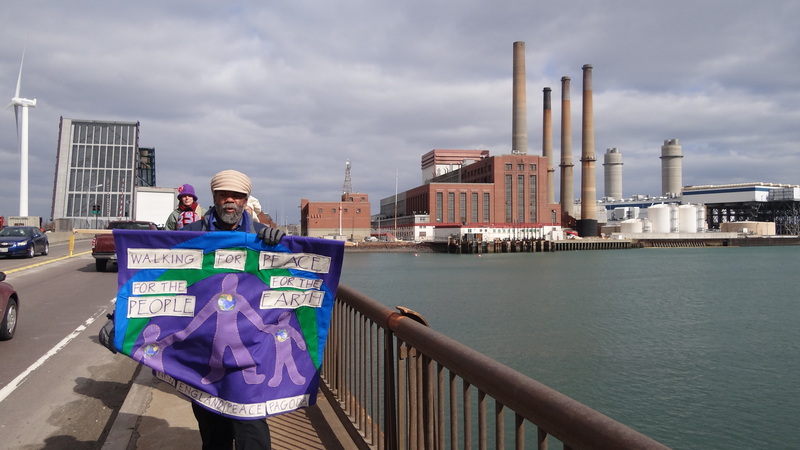 After passing along copies of the Uranium Exploration and Accountability Act and sharing information about the local nuclear reactors in Plymouth, MA (Pilgrim), Seabrook, NH (Seabrook), Vernon, VT (Vermont Yankee) and Millstone, CT the walkers went to Boston City Hall. 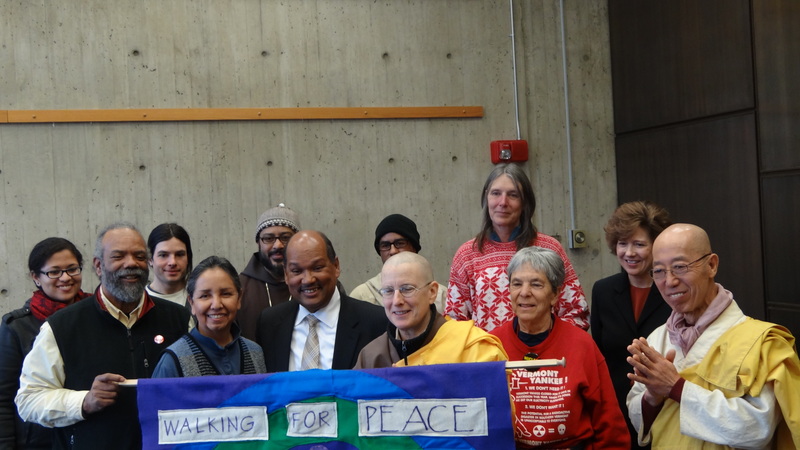 Every year the Walk for a New Spring has the pleasure of meeting with Boston city Councilman Charles Yancey. 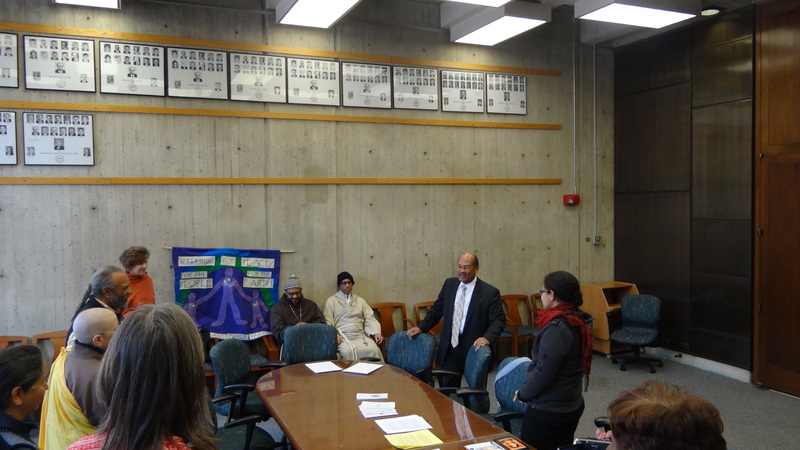 The Boston city council welcomes the walk warmly every year, and is an office that works diligently for their community. This is Councilman Yancey’s 30th year as city councilor. 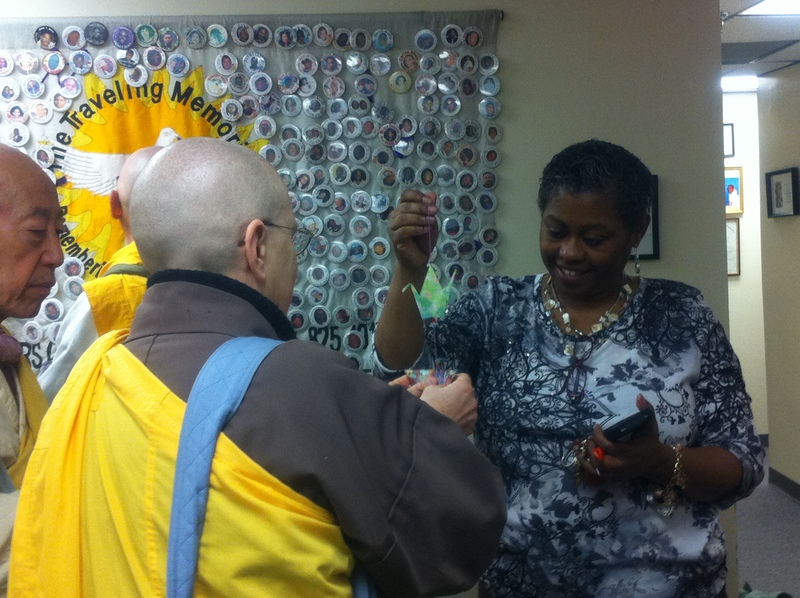 Their tireless dedication to working for positive change is an inspiration. The city Councillor and a few representatives from other offices came to meet the walk and learn a bit more about the work we are doing. 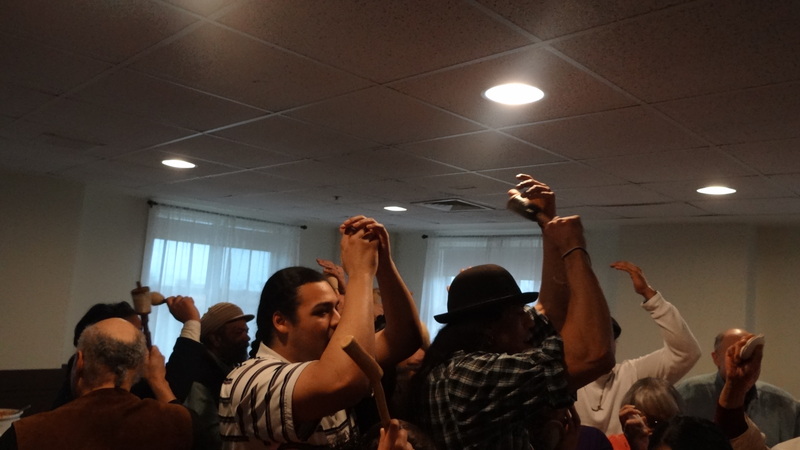 When he learned of the 3,272 abandoned open pit uranium mines on the Sioux Nation Councilman Yancey was appalled, and after he and his staff took copies of the bill they assured the walkers that they would look into the matter further. 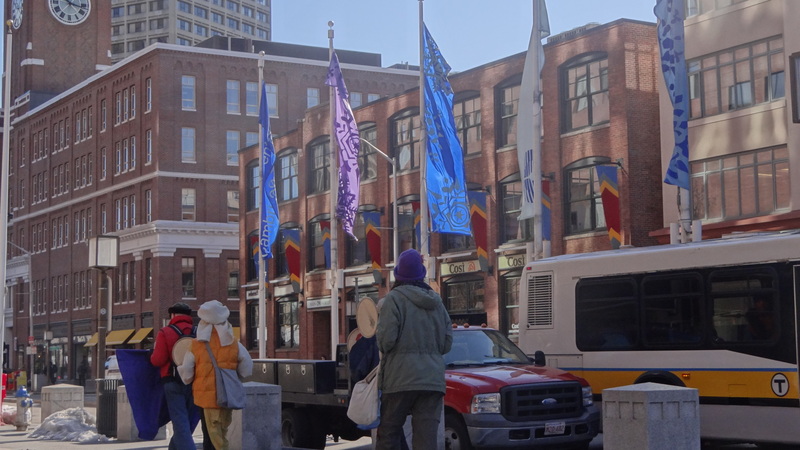 Locally, Boston has its own toxic problem in the shape of a BioLab. & join our facebook event page to learn when we are coming thru your community! 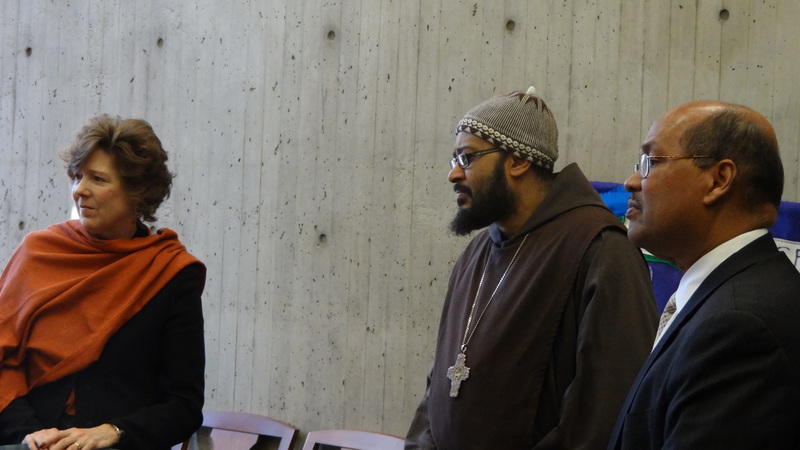 This morning the walk started off at the House of Peace in Ipswich Massachusetts. We have had the pleasure of spending time with long time peace workers John and Carrie Schuchardt, founders of the House of Peace. 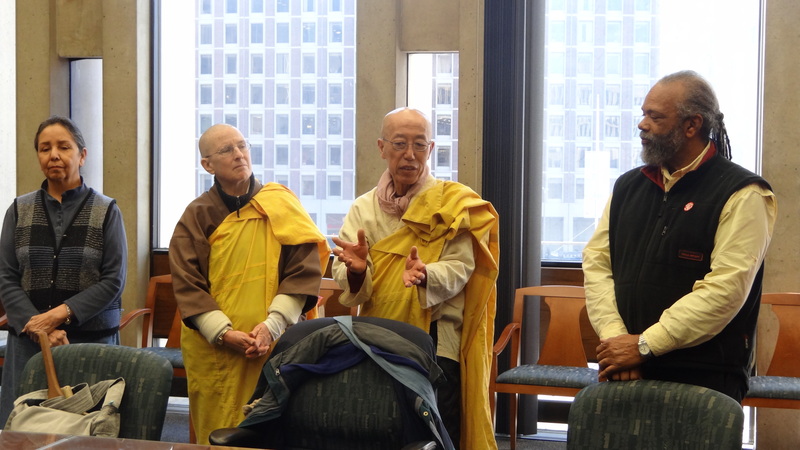 The House of Peace help make it possible for children suffering burns to get treatment at Shriners Children’s Hospital in Boston. The House of Peace hosts the families of the children while they are waiting for surgery. This morning as we left the walk our thoughts and prayers were with Tariq, a seven year old from Iraq who was going in for an eight hour surgery for facial reconstruction. 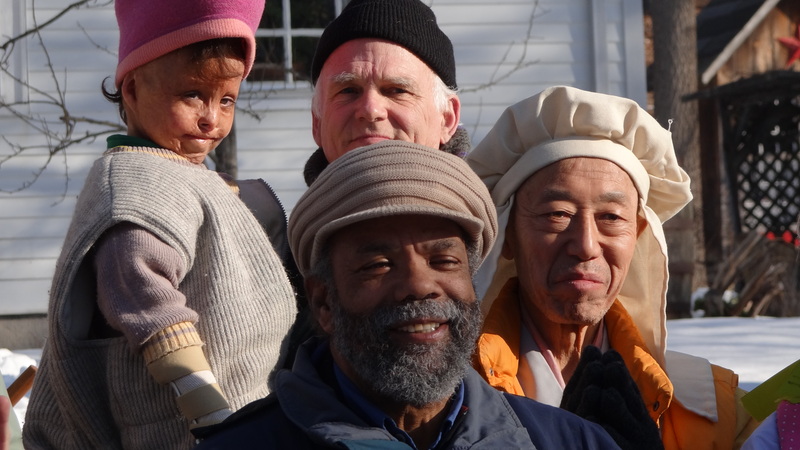 After the house of peace the walkers stopped for lunch at the UU church of Beverly where they were hosted warmly by local members of the congregation. 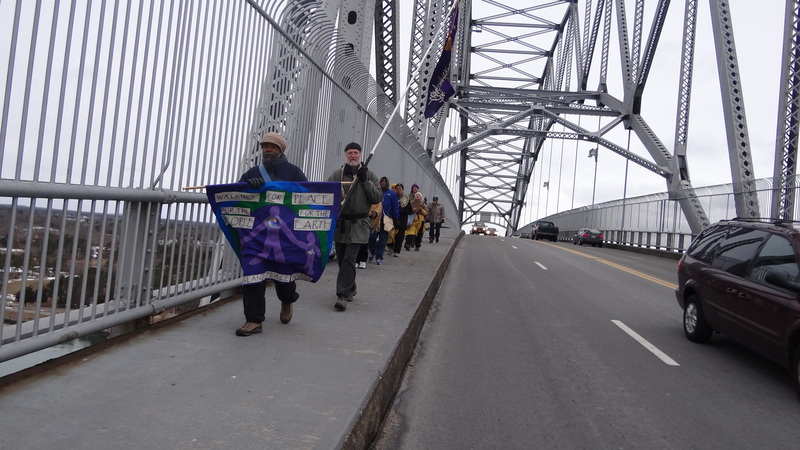 Following a beautiful lunch and song by one of our hosts, Richard, the walk set out across for Salem. 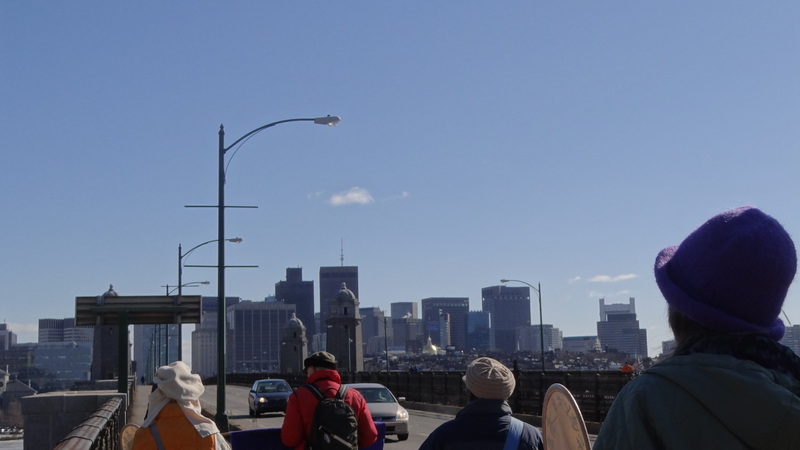 About halfway across the bridge from Beverly to Salem the walk was met by several local families and activists, many from the Peace Commission. 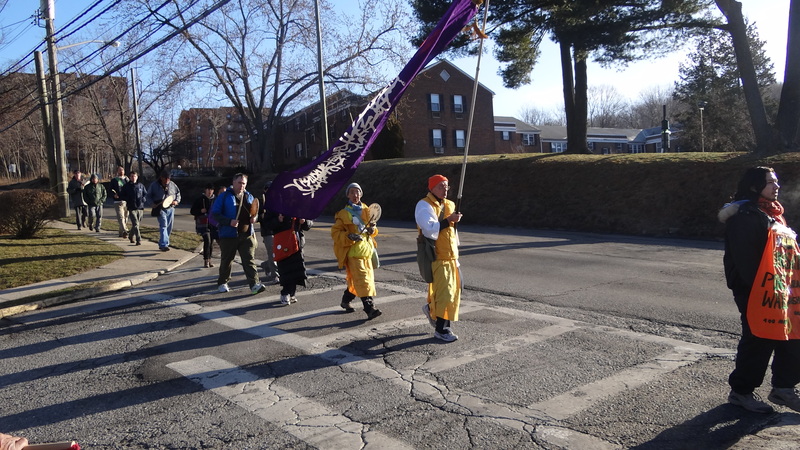 It was a beautiful reception into the city, and the walk was met with joy, honks, peace signs, and waves. 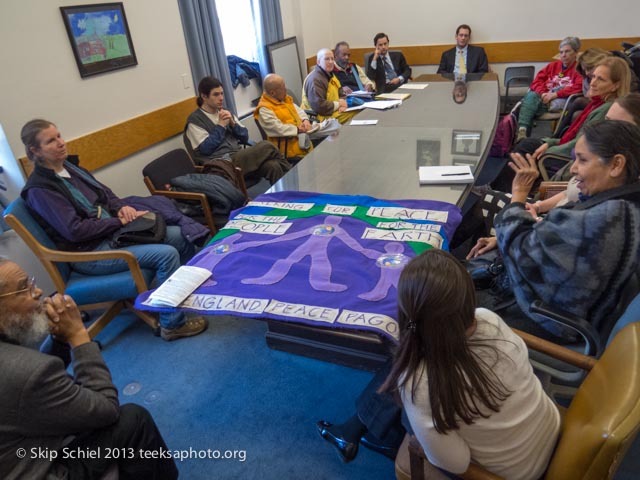 The first stop in Salem was at city hall to meet with Mayor Driscoll, a Mayor for Peace who has hosted the generously hosted the walk in the past. 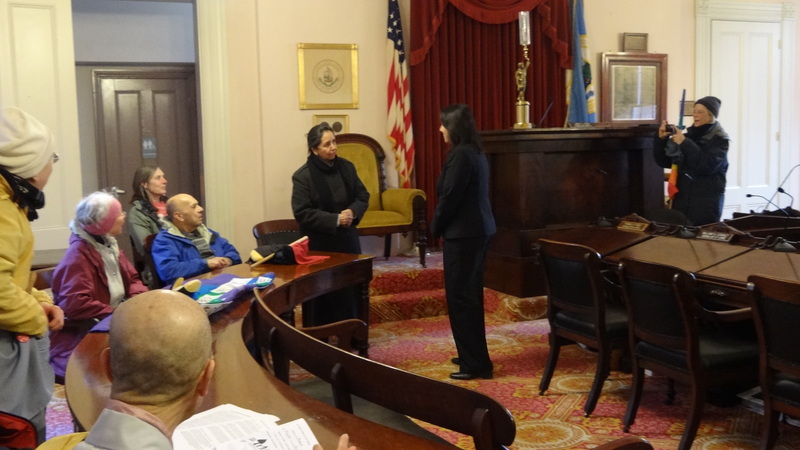 Walkers shared information about the walk with Mayor Driscoll, and she shared some of the ways that Salem is working toward renewable energy, including attempting to get windmills in the city, and converting a coal factory into a much smaller natural gas company. 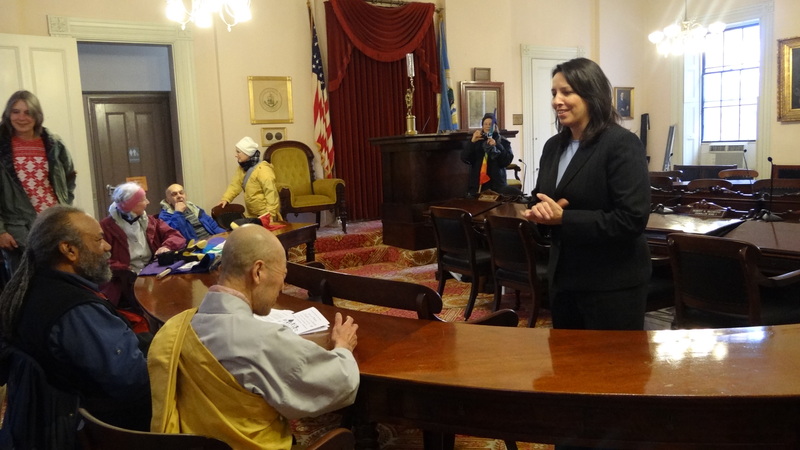 Charmaine spoke with Mayor Driscoll about the situation in South Dakota and its effect on her people, and ultimately all people. 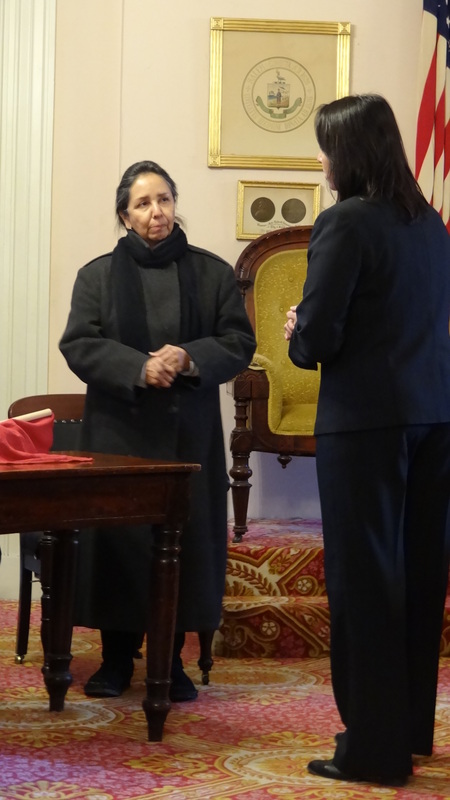 She shared the draft bill that she and the Defenders of the Black Hills wrote. 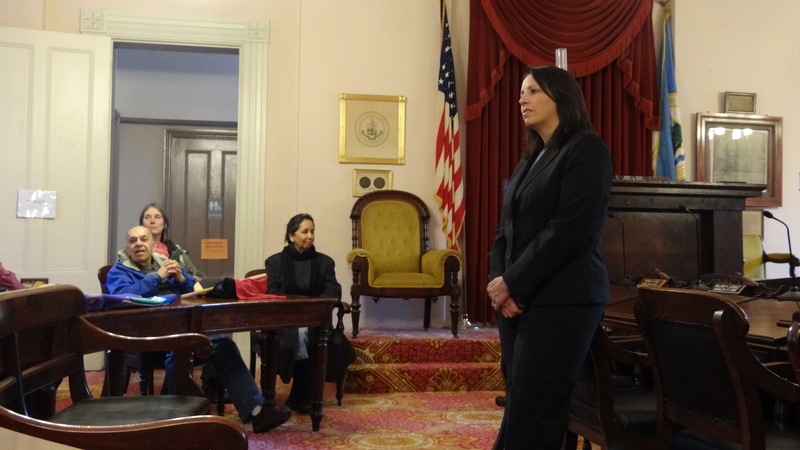 This bill calls for a moratorium on all further uranium mining until all of the existing mines have been cleaned up. The bill would also force uranium mining companies to be held responsible for clean up of any further or existing mines. This bill currently needs a sponsor. 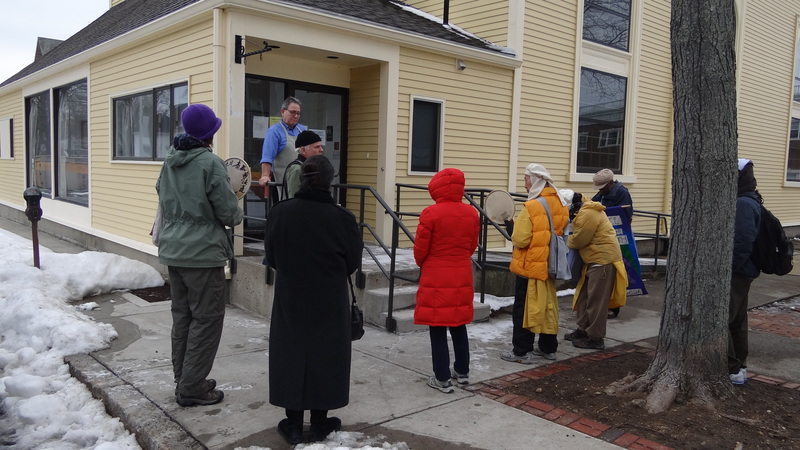 The walk left the mayors office for the First Church, a Unitarian Universalist church in Salem. 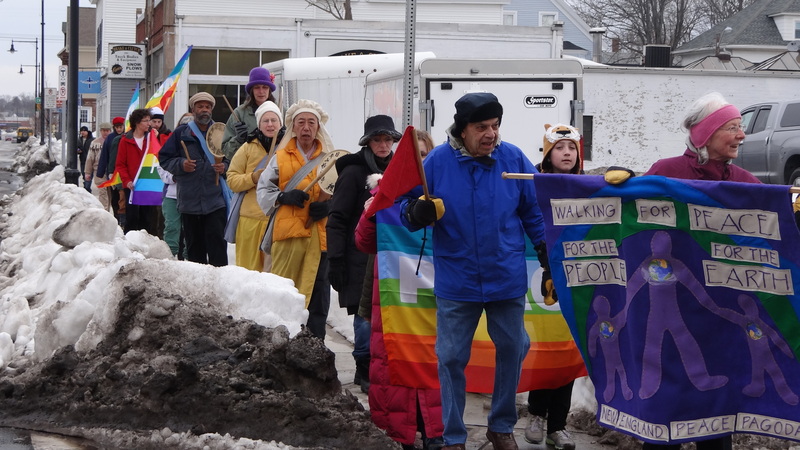 The Peace Commission and Occupy Salem members welcomed the walk graciously and contributed in preparing a potluck and opening up a space for conversation on community action. 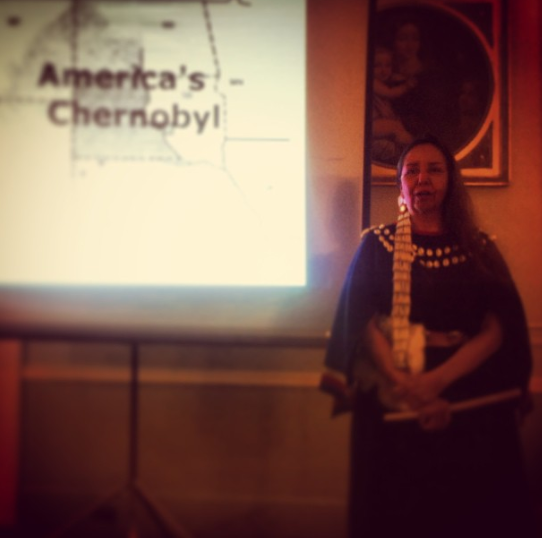 Following dinner Charmaine presented, “America’s Chernobyl” to the crowd. 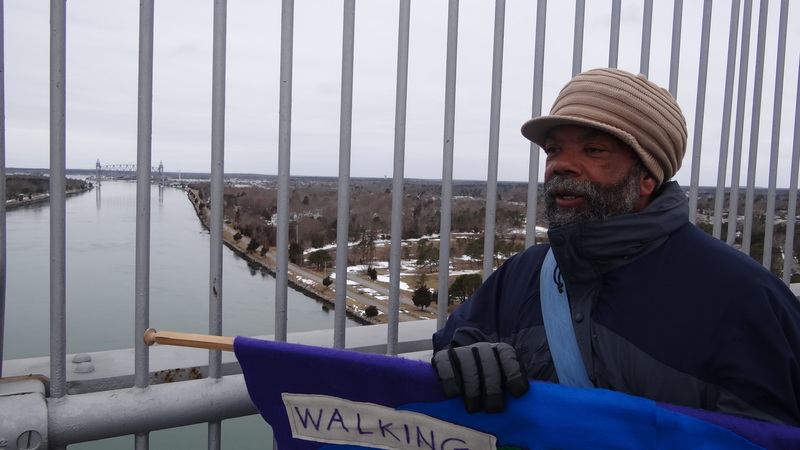 Charmaine will be with the walk for a few more days. 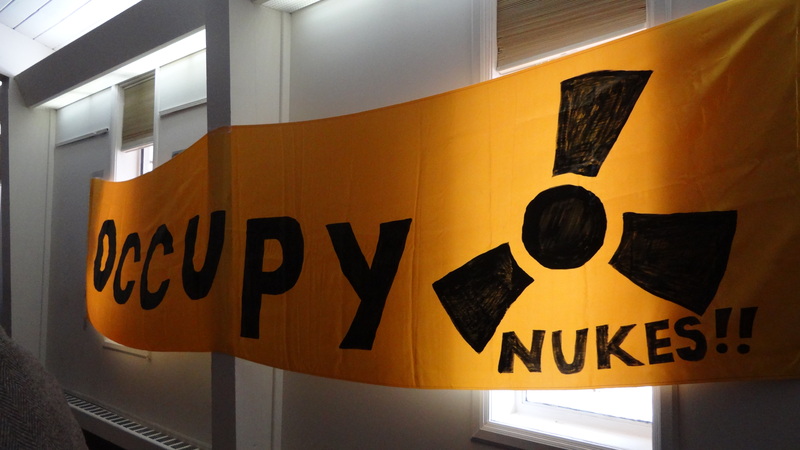 Join us in Boston or on the Cape to hear the incredible story of America’s Secret Chernobyl, and what you can do to work for a nuclear free future.